This year's shark week just ended, but why not dredge up another cool shark story? 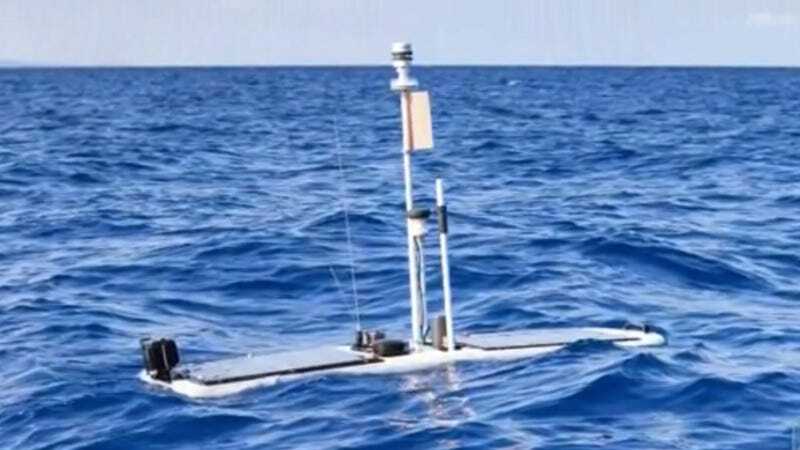 Marine biologists from Stanford University found an unlikely surfer to help them track the migration routes of Great White Sharks: the Wave Glider robot. What will those brainy Stanford Trees think of next?! The Stanford team had been tracking Great Whites for 12 years, and had tagged a number of the big fish to map their migratory routes between Northern California, Hawaii, and Northern Mexico. They recently integrated the latest communication technology into their study to provide realtime data updates. The Wave Gliders are like other shark tag receivers in that they pick up and record signals from the tags when they come within 1,500 feet. But that's where the similarities end. The sleek robot-mariner can also follow the sharks somewhat more stealthily than a boat full of babbling humans. To reach out to the shark fearing non-academic population, Stanford's marine biologists have created an iPhone app that will tell users where Great Whites are most likely hanging out. This sounds great for swimmers and surfers, but hopefully this won't fan people's natural terror of the ocean's greatest predator into hysteria. Shark numbers are dropping off worldwide, mostly because of the increasingly illegal practice of finning. Having been a beach guy all of my life (except for the current Colorado bit), I always figured they're out there, swimming around in their ocean. I'd rather not know where they are, but am glad scientists do.